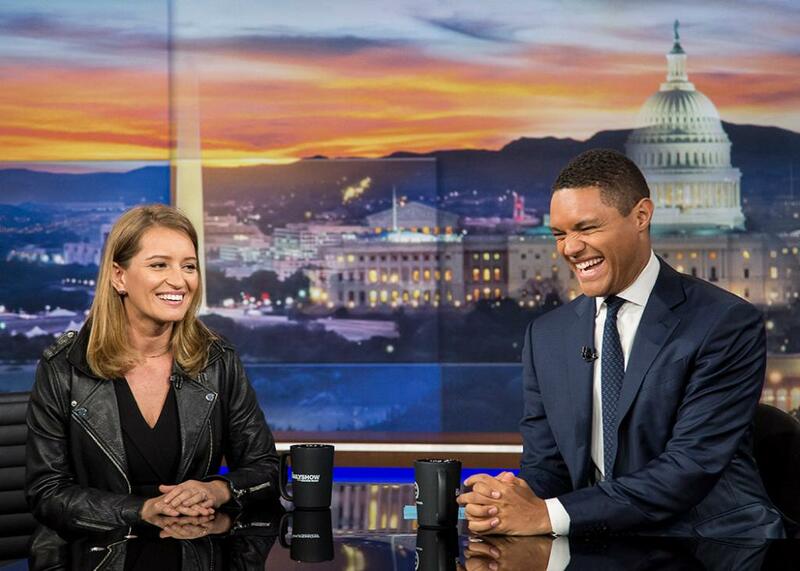 According to this website (click below), Katy Tur is scheduled to be a guest on "The Daily Show with Trevor Noah" on Comedy Central, this coming Thursday (April 27). Check your local listings! Tune in for Katy @11 -- stay for Keith (on 1st episode of The President's Show) @11:30!!! What's embroidered on the back -- "Born To Raise Expectations"? So not who she is. Marie wrote: Overachiever wearing biker jacket. I couldn't help but to think of Keith's leather jacket during his debut on the ESPN2 channel's news program called "Sports Night" with Suzy Kolber! StevenHW wrote: I couldn't help but to think of Keith's leather jacket during his debut on the ESPN2 channel's news program called "Sports Night" with Suzy Kolber! One Katy article, THREE headlines! Their original read "Katy Tur is tougher than she looks." Instantly people began hitting them on the nose with a rolled up Times for the obvious sexism in the wording. So they retitled it "You can't rattle her." I think they've finally found the right formula now, LOL. Too bad readers still have to educate them about such issues. Hi folks, it's been quite a while. I just was looking through my bookmarks and clicked to see if this forum is still here. 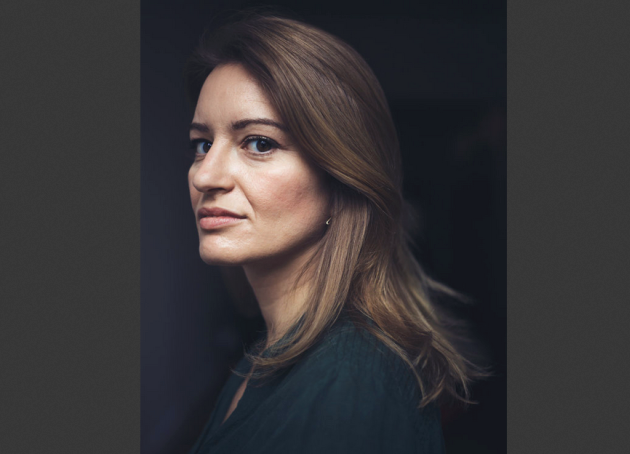 Anyway, I'm posting here on this thread because when Katy Tur was first becoming part of the MSNBC team, I was behaving like a male and checking her out. She was seated in a group and there was an angular shot of her profile. I though, "eh", I don't know". Then another female head emerged into the scene next to Katy. She didn't say anything yet but made some small facial gestures which were instantly appealing. I wondered if I had seen her before. But anyway I just took that she was one of the wave that brought Kasie Hunt, Katy Tur, etc to the fore. She look fascinating to me. Not a FOX News spokes model in looks, just naturally appealing. That was the moment I fell under the spell of Halley Jackson. She sure gets a lot of words into her seconds of air time. And she has proven to be bold and daring as well as very impressive in her manner of touching as many bases as she can in the time she gets. I hope she gets the chance to become the next Andrea Mitchell and have a prominent career doing what's she's doing. I wish she or someone else would get those still photos of the snot she didn't know was swinging from her nose in a cold weather report. It's gross. Must be a conservative hit job. Yay, for Hallie J. OK for Katy T and Kasie and her brother Mike Hunt. RareBird wrote: Hi folks, it's been quite a while. I just was looking through my bookmarks and clicked to see if this forum is still here. 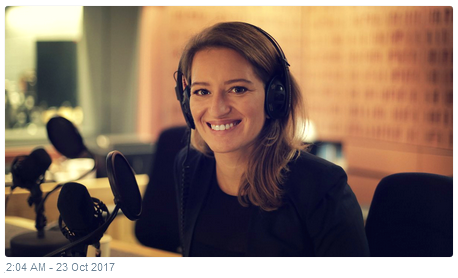 Anyway, I'm posting here on this thread because when Katy Tur was first becoming part of the MSNBC team, I was behaving like a male and checking her out. She was seated in a group and there was an angular shot of her profile. I though, "eh", I don't know". Then another female head emerged into the scene next to Katy. She didn't say anything yet but made some small facial gestures which were instantly appealing. I wondered if I had seen her before. But anyway I just took that she was one of the wave that brought Kasie Hunt, Katy Tur, etc to the fore. She look fascinating to me. Not a FOX News spokes model in looks, just naturally appealing. That was the moment I fell under the spell of Halley Jackson. She sure gets a lot of words into her seconds of air time. And she has proven to be bold and daring as well as very impressive in her manner of touching as many bases as she can in the time she gets. I hope she gets the chance to become the next Andrea Mitchell and have a prominent career doing what's she's doing. I wish she or someone else would get those still photos of the snot she didn't know was swinging from her nose in a cold weather report. It's gross. Must be a conservative hit job. Yay, for Hallie J. OK for Katy T and Kasie and her brother Mike Hunt. Hallie has her own show now, 1pm, following Andrea M. They're all very talented. 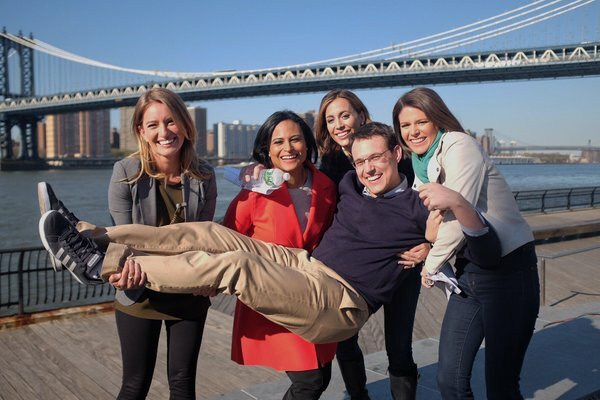 In fact it's an open secret that the women of MSNBC are literally CARRYING their male counterparts. Ken Blackwell, interrupted. He actually looks surprised! Ken Blackwell is a bloviating bozo. Voting was a mess when he was Ohio secy of state. So naturally he's gonna shout you down if you try to point out where he's mistaken. "Can I talk?" is the cry of the thoughtless filibusterer. Katy shows how you handle him. Katy says, "I signed some books at the Hudson News by gate 40 in terminal 1," and wags reply, "Your own, we hope." Marie wrote: Katy says, "I signed some books at the Hudson News by gate 40 in terminal 1," and wags reply, "Your own, we hope." DURING THE US presidential campaign, Donald Trump often singled out reporters at his rallies and berated the media for reporting fake news. NBC's Katy Tur was there from day one of his campaign. 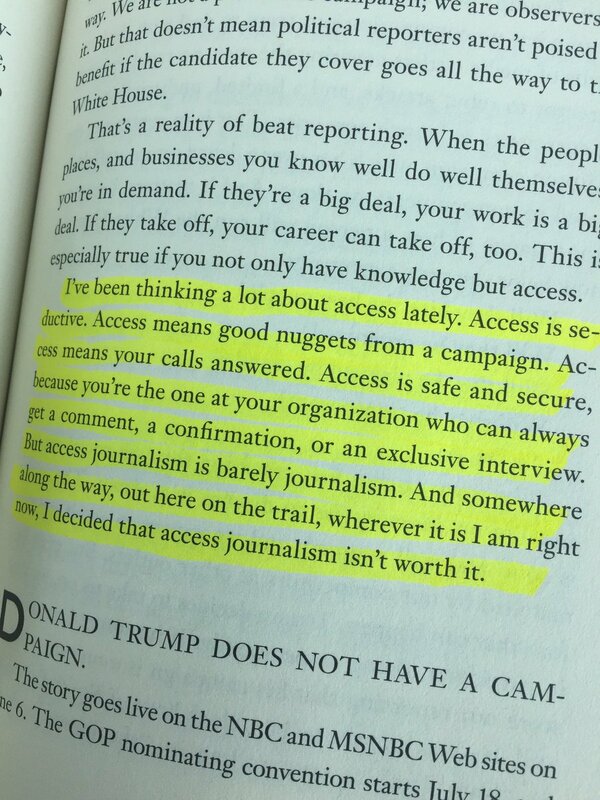 In her new book Unbelievable she describes a "no-rules world" where reporters were, in her opinion, demeaned and discredited. What did she learn about President Trump after two years on his campaign trail? NBC News’ Katy Tur is eloping with CBS News correspondent Tony Dokoupil this weekend. 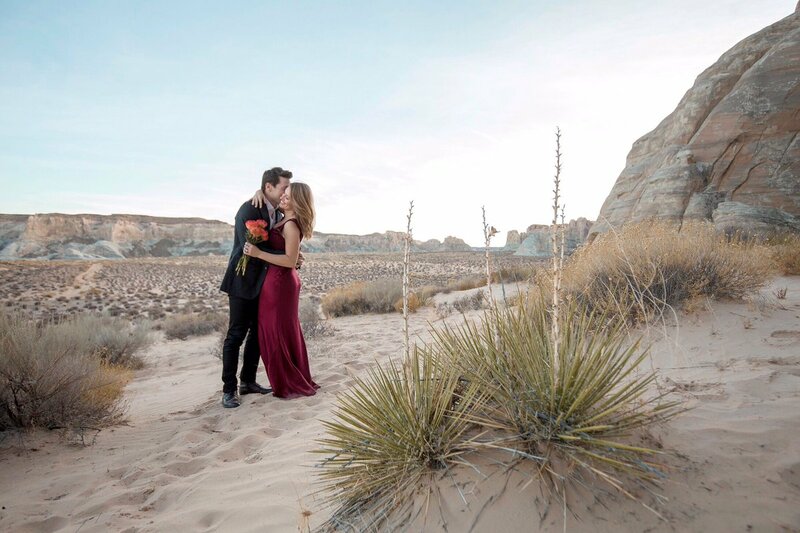 The couple, who met in the makeup room at MSNBC when Dokoupil worked at the network, plan to wed on Friday at dusk in a “nondenominational ceremony in the middle of the desert in Utah,” a source said. “They deliberately picked a place where there will be no cell service and no one around them talking about politics,” says the friend of the couple. 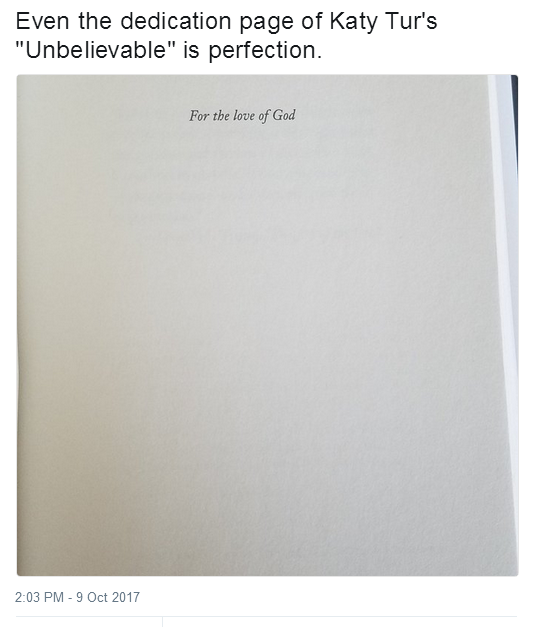 “No setup, no altar, just in front of rocks. Katy said it would be ‘just us and the earth.’ ” The couple even wrote their own vows, and both parents have given their blessing. As revealed in her book Unbelievable: My Front-Row Seat to the Craziest Campaign in American History, Tur’s parents and both sets of her grandparents also eloped. The newlyweds will take a few extra days off in Utah to visit Zion National Park and the Grand Canyon. There will be a party later for friends and family to celebrate.